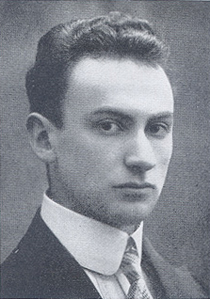 The Russian-born violinist Joseph Achron (1886-1943) earned an early reputation as a child prodigy and later found world fame as a concert soloist. Less remembered is that he was also an important twentieth-century Jewish composer. Born in the Russian shtetl of Lodzey (present-day Lithuania), the son of a ba’al tefillah (prayer leader), Achron made his concert debut in 1893 to great acclaim. He went on to study with two of the greatest violin teachers of all time, Leopold Auer of the St. Petersburg Conservatory and Joseph Joachim in Berlin. Inspired by the contemporary national movement among fellow Russian Jewish composers to create Jewish classical music, he began to compose. One of his earliest efforts, the 1911 “Hebrew Melody,” became his most famous work, recorded by everyone from Jascha Heifetz to Itzhak Perlman. In 1925 Achron arrived in the United States, settling eventually in Los Angeles. There he wrote Hollywood film scores and taught music (among his pupils was the young Andre Previn). But he struggled to build a national reputation as a composer, leading Arnold Schoenberg to remark that Achron was “one of the most underrated modern composers.” At his death in 1943, Achron left an array of chamber works that eventually found a home at the National Library of Israel. With the assistance of that library and the Hebrew University Jewish Music Research Center, Achron’s trove of forgotten compositions has been recovered. The piece to be performed at the March concert, “Four Improvisations,” dates from 1927 and has been reconstructed for its first performance in possibly over eighty years. Now a new generation can rediscover his music and judge his talents as a composer for themselves.